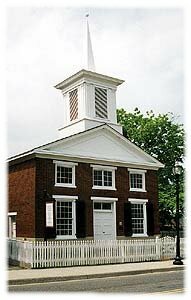 For over 40 years the Bedford Historical Society, an all all-volunteer, nonprofit organization of 400 members has provided leadership and resources for numerous preservation, educational, ad heritage tourism projects. The society's funds come only from private donations and fundraising projects and events. The Historical Society was formed in 1969 to rescue the Historic Meeting House from the bulldozer. The restored Landmark Memorial was the first building in the Town of Bedford to be placed on the State and National Registers of Historic Places (1977) and is now protected in perpetuity by a preservation easement. The Historic Society was also responsible for New London Academy being listed on the National Register in 1971, a necessity for its subsequent restoration by alumni. Numerous other properties, including those in "the historic corridor" in Forest have benefited from National Register listing prompted by the Historical Society. The Bedford Historical Society played an early, unpublicized, and vital role in the future of Poplar Forest as a Bedford County landmark. In addition, an early $5,000.00 contribution was given to the Corporation for Jefferson's Poplar Forest and historical society members provided a valuable resource as docents. In a similar situation, the Bedford Historical Society provided support in the early days of the Avenel project and has given $10,000.00 to the Avenel Foundation to assist in purchase and restoration of the Bedford landmark. Prior to the advent of the Main Street Program in Virginia, the Bedford Historical Society was instrumental in obtaining the listing of the Bedford Historic District on the National Register and providing the resources for early downtown revitalization projects. The society has continued to support the Bedford Main Street program with funding and resources for the façade rehabs, the walking tour brochure, promotions at the Meeting House and other projects. The society has supported and is currently working with the Bedford County and the Virginia Department of Historic Resources on a survey of architectural and archaeological sites in the county. The Bedford Historical Society also donated $1,500.00 to the Bedford Public Library expansion and has provided many educational and promotional services I the community such as the County History Project for 4th graders; numerous tours for visiting groups and area residents; workshops; the Randolph-Macon Academy/Liberty Academy and Lynchburg-Salem Turnpike highway markers; and a variety of heritage tourism activities. For the past several years the Historical Society has been occupied with the preservation and restoration of the Charles & Louise Wharton House which serves as the society's headquarters.